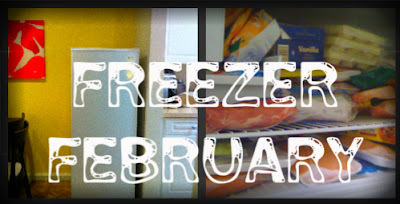 I'm going to be doing a little series here on the blog for the month, called "Freezer February." The goal: Spend as little as possible on groceries this month, and eat as much stuff out of our freezer/pantry/fridge to clean it out. We not only have the freezer over our fridge, but we also have a small standing freezer, so we have plenty to choose from. 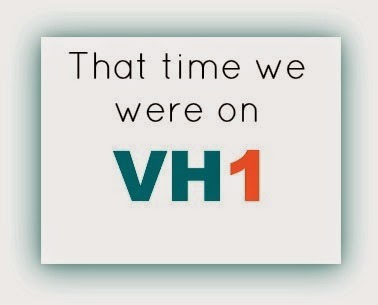 This goal originally popped in my mind because I was pinching pennies in order to save for us to buy two iPads. Thanks to our tax refund, coming soon, we now have enough to buy the iPads, so our next goal is to save up $1000 for our emergency fund, then we will get back on track on paying down debt. 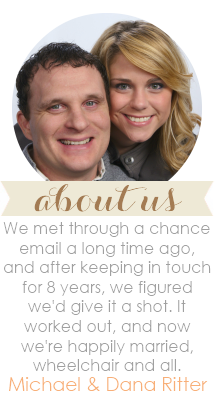 Anyway -- I'm going to be sharing with y'all periodically here on the blog, as a way of keeping myself accountable. So today, I'm going to show you our grocery spending for the week. I actually went to three different stores today. Wasn't planned. The first stop (Safeway) was just a quick stop after church because we needed milk. 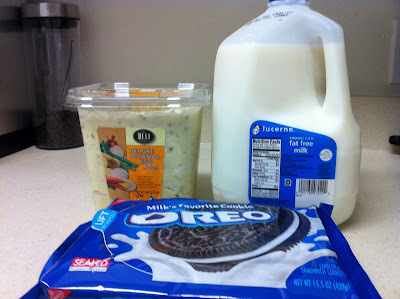 I made an impulse buy of Oreos and some potato salad to have with our Superbowl dinner tonight. Tonight, during the Super Bowl, I made a quick trip to Harris Teeter for just a couple of things they had on sale this week. 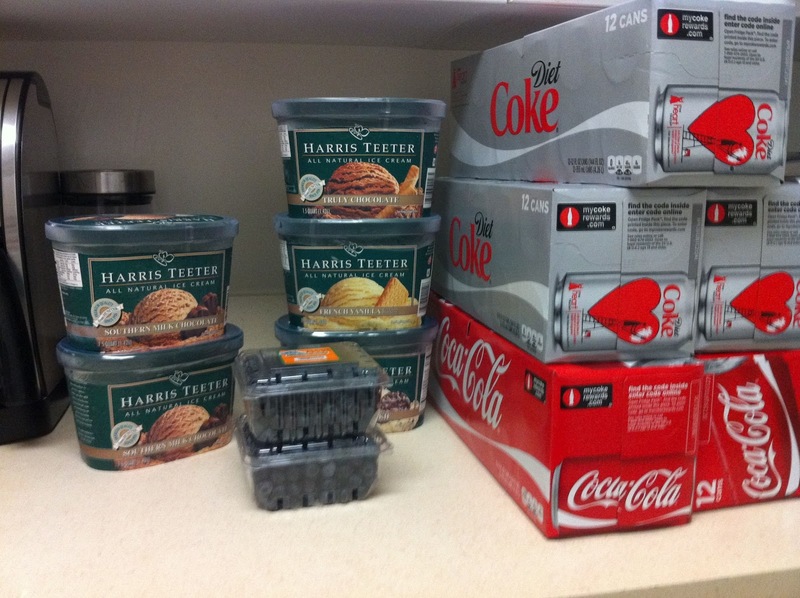 Ice cream, Diet Coke and Coke and some blueberries. The ice cream and Coke products were both buy 2, get 3 free, and the blueberries were buy 1, get 1 free. I spent $29.88 there, and saved $41.23. I also made a quick trip to Target with some coupons in hand for the items you see above. 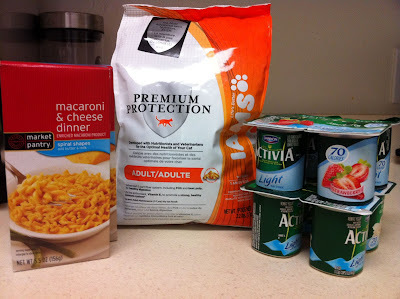 I got some cat food, some yogurt and some mac n' cheese. I spent $5.49, and saved $6.55. So, for the week, I have spent $47.13. Not bad at all, considering our weekly food/household budget is $100! Now, for what we've been eating - I will do a couple posts a week to let you guys see what we're coming up with out of the freezer, but so far, we're doing pretty good! 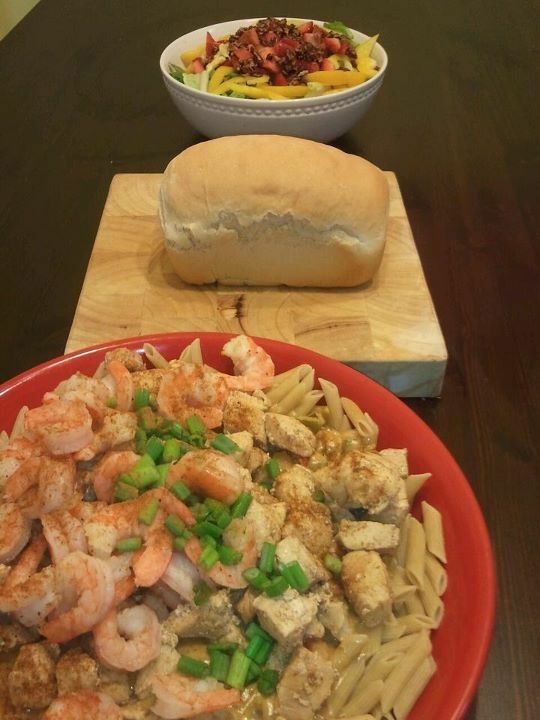 Ragin' Cajun Penne Pasta with Chicken and Shrimp and scallions, homemade bread (YUM) and salad with yellow peppers and strawberries. 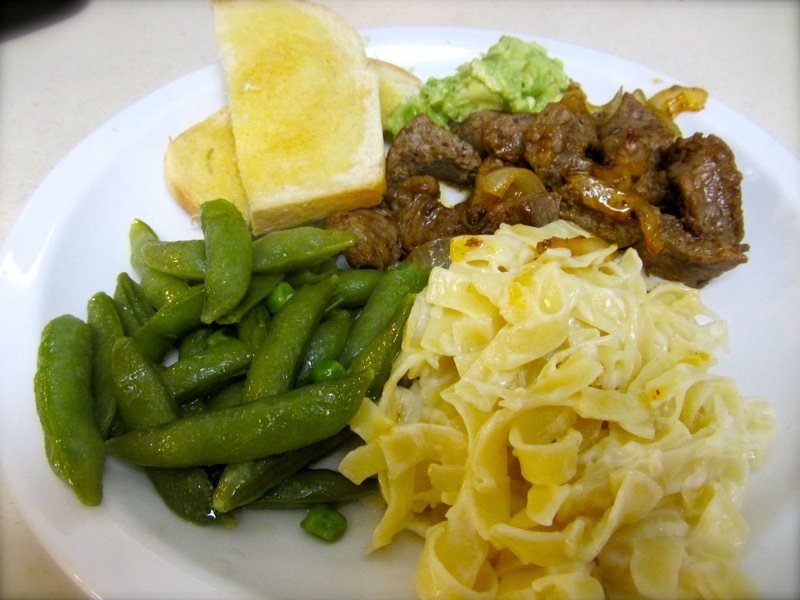 Last night I cooked some steak and onions in the skillet, topped with a little bit of homemade guacamole, some snap peas out of the freezer, one of those Knorr alfredo noodle packet things, and some of the above mentioned homemade bread. My couponing trip is making for a really late dinner tonight, but that's okay - no one is starving around here! Let me know if you want to join me in being a cheapskate this February!! Dana, So glad to hear you challenging yourself to save money on groceries this month with your "Freezer February" challenge. Love it! I've done "Eating from the Pantry" challenges in the past, and it's always great to see how you can stretch what you have on hand and try to cut back spending even more. Hope your month-long challenge is a huge success!